In this symbolic representing of a nuclear reaction, lithium-6 (63Li) and deuterium (21H) react to form the highly excited intermediate nucleus 84Be which then decays immediately into two alpha particles of helium-4 (42He). Protons are symbolically represented by red spheres, and neutrons by blue spheres. In nuclear physics, a nuclear reaction is a process in which two atomic nuclei or nuclear particles collide to produce products different from the initial particles. In principle, a nuclear reaction can involve the collision of more than two nuclei or subatomic particles, but the probability of three or more particles colliding at the same time is extremely small, and such an event is exceptionally rare. In the case of radioactive decay, the transformation is spontaneous, but in the case of a nuclear reaction, it is initiated by the collision. If the particles collide and separate without changing, the process is called an elastic collision rather than a reaction. In the example shown in the figure on the right, 6Li and deuterium react to form a highly excited 8Be intermediate nucleus, which then decays into two alpha particles. Missing rest mass = 8.029 - 8.0052 = 0.0238 atomic mass units. so 1 u c2 = 931.49 MeV. Hence, the energy released is 0.0238 × 931 MeV = 22.4 MeV. Expressed differently: The mass is reduced by 0.3 percent, corresponding to 0.3 percent of 90 PJ/kg is 300 TJ/kg. This is a large amount of energy for a nuclear reaction; the amount is so high because the binding energy per nucleon of the helium-4 nucleus is unusually high, because the He-4 nucleus is doubly magic. The He-4 nucleus is unusually stable and tightly-bound for the same reason that the helium atom is inert: Each pair of protons and neutrons in He-4 occupies a filled 1s nuclear orbital in the same way that the pair of electrons in the helium atom occupy a filled 1s electron orbital. Consequently, alpha particles appear frequently on the right hand side of nuclear reactions. A small amount of energy may also emerge in the form of X-rays. Generally, the product nucleus has a different atomic number, and thus the configuration of its electron shells is wrong. As the electrons rearrange themselves and drop to lower energy levels, internal transition X-rays (those with precisely defined emission lines) may be emitted. 63Li + 21H → 2 42He + 22.2 MeV. The reaction energy (the "Q-value") is positive for exothermal reactions and negative for endothermal reactions. On the one hand, it is the difference between the sums of kinetic energies on the final side and on the initial side. But on the other hand, it is also the difference between the nuclear rest masses on the initial side and on the final side (in this way, the Q-value has been calculated above). If the reaction equation is balanced, that does not mean that the reaction really occurs. The rate at which reactions occur depends on the particle energy, the particle flux, and the reaction cross section. Neutrons, on the other hand, have no electric charge to cause repulsion, and are able to effect a nuclear reaction at very low energies. In fact at extremely low particle energies (corresponding, say, to thermal equilibrium at room temperature), the neutron's de Broglie wavelength is greatly increased, possibly greatly increasing its capture cross section, at energies close to resonances of the nuclei involved. Thus low energy neutrons may be even more reactive than high energy neutrons. Fusion reactions—two light nuclei join to form a heavier one, with additional particles (usually protons or neutrons) thrown off to conserve momentum. Fission reactions—a very heavy nucleus, spontaneously or after absorbing additional light particles (usually neutrons), splits into two or sometimes three pieces (α decay is not usually called fission). Spallation—a nucleus is hit by a particle with sufficient energy and momentum to knock out several small fragments or, smash it into many fragments. (α,α') measures nuclear surface shapes and sized. Since α particles that hit the nucleus react more violently, elastic and shallow inelastic α scattering are sensitive to the shapes and sizes of the targets, like light scattered from a small black object. (d,n) and (d,p) reactions. A deuteron beam impinges on a target; the target nuclei absorb either the neutron or proton from the deuteron. 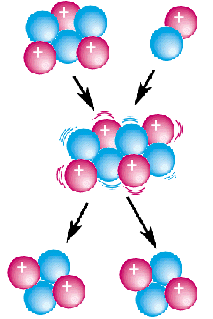 The deuteron is so loosely bound that this is almost the same as proton or neutron capture. A compound nucleus may be formed, leading to additional neutrons being emitted more slowly. (d,n) reactions are used to generate energetic neutrons. The strangeness exchange reaction (K,π) has been used to study hypernuclei. Applying the methods of scattering by two potentials, the plane wave of each free charged particle is replaced by the exact solution for a charged particle moving in the presence of another point charge. Direct nuclear reactions are most often calculated by some form of distorted wave Born approximation. Applying scattering by two potentials, the coulomb solutions and neutron plane waves are replaced by the optical model wave functions for the incident and outgoing particles moving in and near the nucleus. These are obtained mostly from elastic scattering experiments, and from inelastic scattering to vibrational and rotational collective excitations. The reaction itself is then modeled by the Born approximation. That is, the excitation or transfer process is treated as a first order perturbation on elastic scattering. An early improvement on this was to exactly treat the coupling between a small number of excited states, known as coupled channels Born approximation. 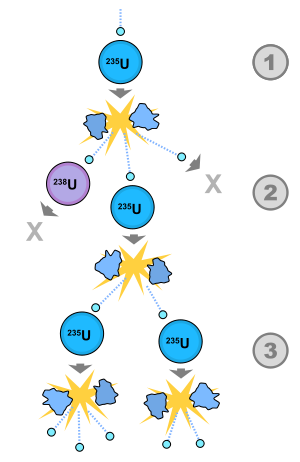 A schematic nuclear fission chain reaction. 1. A uranium-235 atom absorbs a neutron, and fissions in two new atoms (fission fragments), releasing three new neutrons and some binding energy. 2. One of those neutrons is absorbed by an atom of uranium-238, and does not continue the reaction. Another neutron is simply lost and does not collide with anything, also not continuing the reaction. However one neutron does collide with an atom of uranium-235, which then fissions and releases two neutrons and some binding energy. 3. Both of those neutrons collide with uranium-235 atoms, each of which fission and release between one and three neutrons, which can then continue the reaction. A nuclear chain reaction occurs when, on average, more than one nuclear reaction is caused by another nuclear reaction, thus leading to an exponential increase in the number of nuclear reactions. An uncontrolled chain reaction within a sufficiently large amount of fission fuel (critical mass) can lead to an explosive energy release and is the concept behind nuclear weapons. The chain reaction could also be adequately controlled and used as an energy source (nuclear reactor). U-235 + neutron -> fission fragments + 2.52 neutrons + 180 MeV. Pu-239 + neutron -> fission fragments + 2.95 neutrons + 200 MeV. This excludes 10 MeV for unusable and hardly detectable neutrinos. When a heavy atom undergoes nuclear fission, it breaks into two or more fission fragments. The fission fragments consist of atoms of a lighter weight than the original heavy atom. The sum of their masses do not precisely equal that of the heavy atom, even while accounting for the incident neutron. The difference (mass difference) consists of ejected neutrons and the release of binding energy. The neutrons leave the reaction at high speed, and may collide with other heavy atoms in a phenomenon known as "fission capture." This could result in nuclear fission, forming the basis of a chain reaction. The average generation time is the average time from neutron emission to fission capture. The neutrons travel only short distances, on the order of 10cm (the diameter of a critical mass);. An average neutron's speed varies around 10,000km/s, resulting in a timescale on the order of 10ns. This quantity is often referred to as a shake. The effective neutron multiplication factor or κ, is the average number of neutrons that go on to cause another fission reaction. The remaining neutrons either fail to induce fission, or are never absorbed and exit the system. The value of κ for a combination of two masses is always greater that of its components. In some cases its value is equal to the sum of the component κ values. The magnitude of the difference depends on velocity and distance, as well as physical orientation. Passing a small sphere through a small hole produces a particularly large κ: Like firing a fissile "bullet" into a shaped fissile target. k < 1 (sub-critical mass): Starting with one fission, there are on average a total of 1/(1 − k) fissions. Any beginning of a chain reaction dies out quickly. k = 1 (critical mass): Starting with one free neutron, the expected value of the number of free neutrons resulting from it is 1 at any time; in the course of time there is a decreasing additional probability that the beginning chain reaction has died out, which is compensated by the possibility of multiple neutrons still being present. k > 1 (super-critical mass): Starting with one free neutron, there is a non-trivial probability that is does not cause a fission or that a beginning chain reaction dies out. However, once the number of free neutrons is more than a few, it is very likely that it will increase exponentially. Both the number of neutrons present in the assembly (and thus the instantaneous rate of the fission reaction), and the number of fissions that have occurred since the reaction began, is proportional to , where g is the average generation time and t is the elapsed time. This cannot continue, of course: k decreases when the amount of fission material that is left decreases; also the geometry and density can change: The geometry radically changes when the remaining fission material is torn apart, but in other circumstances it can just melt and flow away, etc. When k is close to 1, this calculation somewhat over-estimates the "doubling rate." When a uranium nucleus absorbs a neutron it enters a very-short-lived excited state which then decays by several possible routes. Typically it decays into two fragments, fission products, typically isotopes of Iodine and Cesium, with expulsion of a number of neutrons. The fission products are themselves unstable, with a wide range of lifetimes, but typically several seconds, and decay producing further neutrons. It is usual to split the population of neutrons which are emitted into two sorts—"prompt neutrons" and "delayed neutrons." Typically, the "delayed neutron fraction" is less than 1 percent of the whole. In a nuclear reactor, the variable k is typically around 1 to have a steady process. When a value of k = 1 is achieved, when all neutrons produced are considered, the reaction is said to be "critical." This is the situation achieved in a nuclear reactor. The power changes are then slow, and controllable (that is, with control rods). When k = 1 is achieved counting only the "prompt" neutrons, the reaction is said to be "prompt critical"—much shorter doubling rates can then occur, depending on the excess criticality (k-1). The change in reactivity needed to go from critical to prompt critical (i.e. the delayed neutron fraction) is defined as a dollar. The value of k is increased by a neutron reflector surrounding the fissile material, and also by increasing the density of the fissile material: The probability for a neutron per cm traveled to hit a nucleus is proportional to the density, while the distance traveled before leaving the system is only reduced by the cube root of the density. In the implosion method for nuclear weapons, detonation takes place by increasing the density with a conventional explosive. which ranges from 0 for k = 1 to 1 for k = 3. For values of k which are little above 1 we get approximately k - 1. Detonation of a nuclear weapon involves bringing fissile material into its optimal supercritical state very rapidly. During part of this process the assembly is supercritical, but not yet in optimal state for a chain reaction. Free neutrons, in particular from spontaneous fissions, can cause predetonation. To keep the probability low, the duration of this period is minimized and fissile and other materials are used for which there are not too many spontaneous fissions. In fact, the combination has to be such that it is unlikely that there is even a single spontaneous fission during the period of assembly. In particular the gun method cannot be used with plutonium. The concept was first developed by Leó Szilárd in 1933. He supposedly thought of the idea while waiting for a red light. He patented the concept the following year. Leo Szilárd attempted to create a chain reaction using beryllium and indium in 1936, but was unsuccessful. In 1939, Leo Szilárd and Enrico Fermi discovered neutron multiplication in Uranium, proving that the chain reaction was possible. The first artificial self-sustaining nuclear chain reaction was initiated by the Metallurgical Laboratory, led by Enrico Fermi and Leó Szilárd, in a racquets court below the bleachers of Stagg Field at the University of Chicago on December 2, 1942, as part of the Manhattan Project. The only known natural self-sustaining nuclear chain reactions were discovered at Oklo in September 1972. ↑ Atomic Weights and Isotopic Compositions Retrieved January 27, 2015. Einstein's Letter to President Roosevelt - 1939. Annotated bibliography on nuclear chain reactions from the Alsos Digital Library. This page was last modified on 14 December 2018, at 15:43.